Dubai is a city of many wonders. People come to Dubai for business and pleasure. What ever purpose you visit Dubai it is worthwhile to do a Desert Safari in Dubai. This is a thrilling Dune Safari Tour that takes you to the fine desert sands of Arabia where you drive on the sand with interesting tactics to give a thrill to your experience. It is an experience you do not want to miss out on, while in Dubai. Dubai Desert Safari is probably one of the most popular tour in Dubai. You can easily take this tour on any day during your stay in Dubai. There is a departure of this tour every day and you do not have to worry about the high cost of FIT tour rather this tour always has enough participants to materialize on any day of the week. 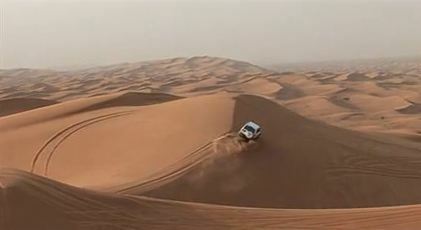 Exotic Dubai Tours & Safaris has 2 options for Dubai Desert Safari. 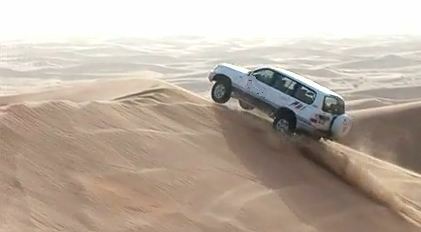 The most popular desert activity in Dubai. Dubai Desert Safari is probably the most taken tour in Dubai. We pick you up from you hotel or residence be it any where in Sharjah Dubai or Ajman than we drive to the desert where after a fresh up the drivers of the safari will reduce air in their Jeep wheels and drive into the sand dunes give you a thrilling experience in the sandy Arabian desert the highlight of Dubai Desert Safari. You will drive up and down the sandy hills as if skating in the sand than we will drive you a small desert camel farm where camels are raised in their natural environment. We will bring you back to the hotel around 9:30 PM. The cost of the tour Inclusive of all Pickup from your place of stay and drop back, Dune safari Dinner dance soft drinks tea coffee is US$ 62.00 Per person and US$ 40 Per Child. Cost does not Include : alcoholic drinks which are available at extra cost. During overnight safari we will pick you up like evening safari and do the same activities as above but instead of returning back to Dubai in the evening we spend the night at camp while having tea and coffee and sleep in the tents under sky and watch the stars The camp staff remains at your service to serve tea any & drinks any time. Water for the tea and coffee is crystal clear and ran through a water filter to remove any impurities in the water. We use only the best water filter for our refreshments to insure a refreshing and enjoyable drink. In the morning breakfast is served and you will be driven back to Dubai.